As some of you maybe know, I’m working on a reconstruction of The Phantom Menace in full HD for more than one year. The goal of this project is to provide a 100% theatrical version of the movie, in 100% HD (not a single frame in upscaled SD, everything in real 1080p), as it was never released, except maybe a German HD broadcast that was never succesfully recorded. I didn’t want to create a thread about it until my project was advanced enough. Well, I feel that it is now advanced enough ! I think it’s time to talk about it and share on this forum some sources, some personal techniques to recover missing scenes in HD, the results that I can get, and to discuss about it. Other similar projects are on the way (certainly Poita’s 35 mm scan and ChewieLewis HD reconstruction, and maybe other ongoing projects), so it seems to be a good time to talk about mine. While other projects are pursuing the same goal (providing a theatrical version of The Phantom Menace), they take different paths. I hope that when each project will be released, it will be possible to merge the various skills of everyone to achieve an ultimate version. The original theatrical colors are not available in HD: the HDTV version has too much red everywhere and contains some scene differently regraded than others ; the Blu-Ray was re-regraded on a scene by scene basis and has no more original color at all. Some scenes seem to be definitely lost in HD and only available in (poor) SD : arrival on Coruscant – with a view on Palpatine’s office (replaced by a taxi sequence), Palace of Naboo by night without an added CGI-bridge, and Senate scene with a cameo of Trish Biggar and Iain McCaig as Senators. Other scenes were reassembled differently in HD, or were available only on some bonuses, but they are not definitely lost. The scene of Qui-Gon on Tatooine by night was directly taken from Digital Video for HDTV and BR versions, contrary to the original 35mm version, so the colors are pretty different. The original colors can be deduced from some versions, since LaserDisc, ORF1 broadcast, Euro Canal Plus broadcast and some bonuses on Blu-Ray or Digital Collection show the same range of colors (once they are well calibrated), that perfectly fit old photos taken from 35mm in early 2000. For the rest, the amazing DrDre’s Color Matching tool, and a lot of time, allowed me to do a scene by scene color regrading. 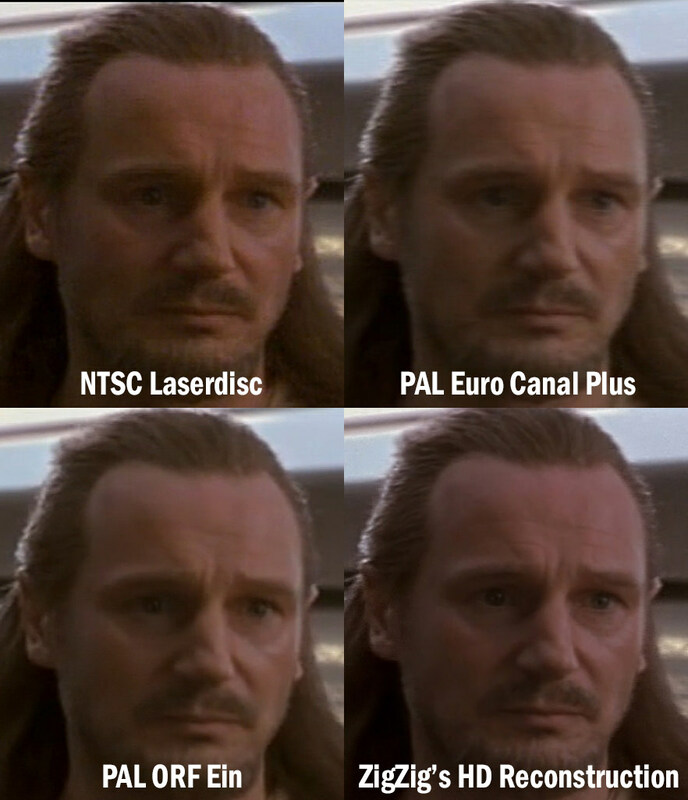 Widely enhancing video quality by using ^…^'s PaNup technique (as described here) and merging together ORF1 broadcast, Euro Canal Plus broadcast, LaserDisc and VCD. Then, a very complicated technique of my own (whom I’m very proud of) that gives full HD frames. Everything was edited in 24p (not 23,976p), as it was shown in theaters almost 20 years ago. Every shot was upscaled in 4K using Super Resolution fo better HD-reconstruction, then downscaled to 1080p. Theatrical DTS sound was fully restored from theatrical DTS CD-ROM, without any other audio treatment than applying the APT-X100 post production recommendations (as found here). Theatrical Dolby EX 6.1 was fully restored from Laserdisc. Is there a contention with other projects ? Well no. We waited so long to have a theatrical version of The Phantom Menace in HD, that we will not sulk our pleasure now that several projects are moving forward! There is definitely no contention with Poita, since the two projects are totally complementary, and I rely heavily on his work to further improve the missing scenes in HD (and I financialy support it). Regarding ChewieLewis, we started this project approximately in the same time (even though I’ve already talked about mine a long time ago). It seems that we work with the same sources and we will probably achieve similar results, even I’m pretty confident that the scenes fully rebuilt in HD will probably be sharper and more detailed in my version, due to the technique I developed. But as far as I am concerned, there is no contention, but rather a kind of « competitive sportsmanship » which is probably pushing us to go beyond our limits, and it’s a good thing. I am pretty sure that some scenes will be more satisfactory in his version, and others in mine, and I really hope that we eventually can make later an even better common version. As I have a little girl that requires a lot of time, plus a full time job, it will take me several more weeks to release something. The scenario is to release my version before the 20th anniversary (19th May 2019), and I hope even in 2018. Will your final output be 24.000fps or 23.976fps? And will you be restoring theatrical subtitles baked into the video like Despecialized, or will you keep the HDTV subs or use soft/hardware subs? This question does not really arise in Europe, since both formats are fully supported. AFAIK, hard subs were only visible in the original English version. Dubbed versions didn’t contain English hard subtitles (but German, Italian or French subtitles instead). So my idea is to release a file without burned-in subtitles (to allow future international versions), then to add picture-based subtitles (that match the theatrical English version) when muxing mkv or Blu-Ray files. What do you think ? Is it a good idea ? Since the work is not finished yet, do not hesitate to propose something else! I’m partial to burned in subs, but that’s mainly because my media player doesn’t recognize default or forced sub flags and I hate having to manually turn them on every time. Plus it would match my Despecialized SW and ROTJ, my HDTV AOTC preservation, and the official TFA and RO releases. But that’s my personal preference - if you’d rather do graphical PGS subs that are a close match to the theatrical, that’s your choice. I also don’t think you’d be able to do the dissolves that way as they exist in the theatrical version, but I could be mistaken. But this is also coming from a US citizen, so I understand the desire for more universal compatibility with multiple languages. I guess I’m just partial to the idea of preserving the English theatrical version exactly as it was. A big thank you for these reflections, your arguments are relevant and definitely admissible! That sounds like a good compromise indeed. Really looking forward to this ZigZig. Thanks to Trillary Dump, a new HD image of the original Senate scene miraculously resurfaced (see original post here). Precisely, my HD reconstruction tool feeds on this kind of HD images: the more it receives, the better the final result is. So I added this new image to my tool and regenerated the scene. I’m currently writing a tutorial about this technique, with a video sample from another missing scene (arrival on Coruscant) which gives an astonishing result identical in quality to the HDTV version. But it takes lot of time (especially since English is not my mother tongue, and I have a little girl who asks a lot of attention everytime I try to sit at my computer). At the request of a member of this forum, I uploaded the “simple” overlaying of two SDTV rips (aka spOrv’s “PaNup”) on MySpleen. It is NOT the HD reconstruction I’m currently working on, but a good SD version that I made to use as guide for my current project. PS: I don’t know if it is better to make a new thread about it, or just to mention it in this thread… Dear moderators, don’t hesitate to move this post to a new thread if it’s better. This file was originally intended to private use only as a guide for the project of HD reconstruction I’m still working on, but someone from OT.com asked me to share it. So Trillary Dump, this is for you! How does one over multiple video sources anyways? Just throwing this out there as a suggestion - a lot of us want to see theatrical Ep 1 in HD, but I think a lot of us also want to see Theatrical Ep 1 WITH CGI Yoda. TPM creates this conundrum of the theatrical version being less canonical with Eps 2 and 3 due to the use of Creepy Puppet Yoda. Maybe two versions would serve well to address this second, less vocally sought after version? I have a lot of faith in your process and the eventual quality of your release. Thank you for your message. I’m not sure that I understand the purpose of your suggestion. What would be the interest of a theatrical Ep1 with CGI Yoda, vs. the official Blu-Ray release (that stars already a CGI Yoda)? Do you mean that you want to see the original cut (with a shorter podrace, no air taxi sequence and so on), but with CGI Yoda instead of CPY? I believe that’s what he means. It’s something I’d be interested in myself as well, but would certainly not fit as a “preservation” in any sense, so it’s kind of irrelevant for this project. Yes - while I prefer theatrical TPM, Yoda not being consistent in the prequels makes my viewing preference a toss up. I understand that this is a preservation, so you may not feel it’s within your desired goals to release such a version. My suggestion is intended more to provide you the opportunity to simultaneously create such a project while you’re already in the thick of things, as opposed to someone else using your project later on as a source to release such a hybrid version. I could indeed release a fanedit (with CGI Yoda into theatrical cut) at the same time as I’m working on my preservation. I think it would be better to create a “theatrical CGI Yoda” cut using Blu-Ray footage for everything except what’s necessary to revert the original editing here and there, otherwise you’ll have a big gap in visual appearance between the CGI Yoda shots and everything else. It probably wouldn’t be that hard of a project to tackle, though I imagine you’d want to start with a color corrected and regrained version of the BR just because, well, why wouldn’t you? Well, that is definitely a good idea for a new fanedit… that I’ll consider after my current preservation project! Since this project will be 100% theatrical, any theatrical audio track would be in good sync. The original theatrical DTS audio track will be already included.